PRODUCT DESCRIPTION: This is our kit which comes with the sprayer. These kits are great if you do not already have a sprayer that will be needed. We sell two kits, one with a quart of concentrate with sprayer and one with a gallon of the liquid iron with a sprayer. Liquid Iron/Fertilizer which has several nutrients including Copper, Manganese and Zinc. The Chelated Iron is a 3.5% and is enough to treat 1000 sq/ft well per quart of concentrate. 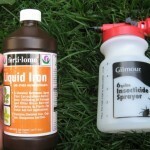 There is little risk of burning or hurting the grass with this formulation. Use it 2-3 times a growing season for maximum benefit and deep, dark green grass. WHERE TO USE IT: On grass which is a little faded or malnourished and needs some greening help. 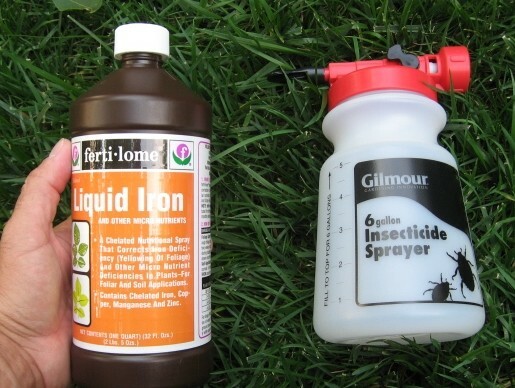 Can be used on plants, flowers, shrubs or trees as well. RATE OF APPLICATION: Quarts will treat 1,000 sq/ft well; Gallons will cover 4000 sq/ft. Use a hose end sprayer to apply it.